A new year in the event industry means new trends, new areas of interest, and new stats based on research from 2017 and applying it to planning and preparation for 2018. We’re doing a round up of some tips and highlights about what to expect in events in the year ahead. With the enormous and overwhelming amount of new tech surfacing in the event industry, such as Artificial Intelligence, it’s important to focus on its more practical applications. Look at using chat bots and facial recognition. A developing trend to be mindful of and for those planners who focus on destination events and conferences – the rise of the “bleisure” traveler. – Attendees will give even more significance to your choice of location. – Schedules must be appealing. Don’t be surprised if bleisure travelers leave early to make the most of their time. As a planner, you will either need to accommodate that or make sure that you give them reason to stay. – Room blocks may lose their interest. While staying central to the action is usually the most convenient option, if bleisure travelers are bringing guests, we may see them make additional choices based on their traveling partner’s needs. – All work and no play will fade away as more of the attendees under 36 look to experience the host city. – Extended group rates might be in order. In the past, the hotel block was negotiated for a day before and a day after. It now may be a necessary perk to offer additional savings to those who want to prolong their stay. – Partnering with other outfitters to offer a total experience. – Networking can and will occur prior to the event and possibly outside of your influence. “Event design trends for 2018 will be dominated by fresh takes on decades past, experts say. These predictions come from a meeting earlier this month of the New York chapter of prominent culinary group Les Dames d’Escoffier.” – Kelly Rehan, Special Events. – Plant-based food will be kicked up a notch. First it was nose to tail; now it is stem to stalk. – Culinary leaders will use the untapped resources of the ocean to introduce new foods and species to consumers, all with sustainability in mind. Think algae and spiny dogfish. – Staff happiness will top the list of restaurateur concerns. – Consumers want to know what’s in their food and where it came from. On tap is increased interest in the origins, content and production methods of wine and spirits. – Natural wines from Croatia and Georgia will gain respect. – Put a pretty face on it: Sustainable seafood meets savvy marketing. Montauk sea bream sounds tastier than plain old porgy. – Demand for healthier fare shows no signs of slowing. Chefs will rethink traditional favorites. – Culinary education for kids at home and school will be key to a healthy future. – Foods to watch: seaweed, hemp, pulses, cricket flour, grass-fed beef. – The future of food is cooking. It can be a piece of toast or an entire meal. – A mix of classic, nostalgic dishes with a modern twist. – Ninety-one percent of bartenders said they plan to use vegetables in their cocktails in 2018—and not just as garnishes. Expect to see nontraditional vegetables such as beets, carrots, butternut squash, radishes, green beans, and more popping up in cocktails. – Tacos with international-inspired fillings. According to the GBTA, 20% of organizations do not have a risk management plan in place, and an additional 8% are unsure if they event have a plan. Focus less on early bird rates, classic room set ups, traditional buffets, excessive printing, and a lot more of the same ‘ol same ‘ol. Think about what experiences your guests are hungry for. How can you provide VIP experiences that are accessible and result in an immediate FOMO response if they’re not on the registration list? I think we can all agree that options of events to attend are endless. So amidst all of that chaos and noise, what are you doing t make yours stand out? Look no further than your own backyard, especially if you have out of town guests. They’re keen to experience culture unique to the destination. That applies to speakers, entertainment, cuisine, breweries/distilleries, venues, artists, designers, and so on. And to go a step further, how can you leverage the relationships you have with various local service providers to dig a level deeper and get their ideas for go to’s that their businesses typically use. Think practicality meets immersive, curated, and unique experiences. Be thoughtful. Be mindful. Be purposeful. Be impactful. Add value. Avoid excess. 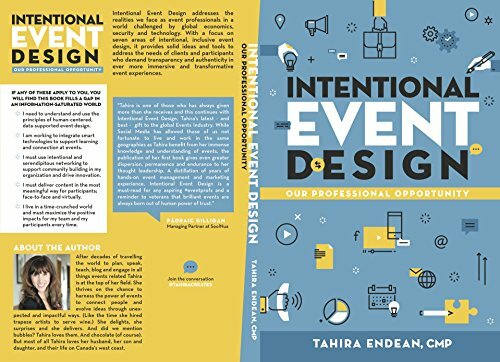 A great go to resource on the topic is Tahira Endean’s new book titled “Intentional Event Design”. The list above doesn’t have all of the answers to what we can expect in the year ahead, but it’s a pretty darn good start! Now, go put these ideas to the test. ← Oh Hey There! Remember Me? Still Kickin’ It, Tycoon-Style!